Home » Apex Legends » Apex Legends Ping System Guide – Menu, Ammo, Weapons, and More! Apex Legends Ping System Guide – Menu, Ammo, Weapons, and More! We're taking a detailed look at the advanced pinging system in Apex Legends! 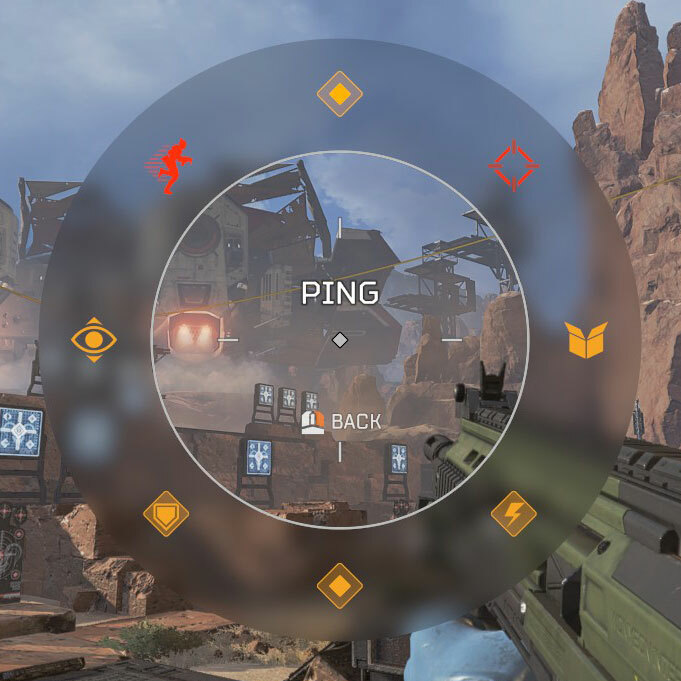 Our Apex Legends Ping System Guide walks you through all you need to know about this highly intuitive non-verbal communication feature. If you've ever disliked talking over VoIP in the past, then this innovative ability will be very useful to you. Probably one of the most surprisingly detailed features in Apex Legends is the non-verbal communication ping system. This might sound like a minor thing, but being able to quickly display to your teammates where an enemy is without having to put it into words is quite valuable. It can also be a useful tool for playing with people of a different language, or for people without a microphone! The basic ping places a yellow marker where ever your crosshair is currently targeting. This is generally used to display a location of interest. You can only have one of these basic pings active at one time and they will disappear after 15 seconds. If you place your crosshair on the marker and press the ping button it will cancel the ping. To ping on PC you will need to press your middle mouse key once. To ping on Console you would use R1 or the right shoulder button. If you want to confirm something with a teammate and you don't have a mic or you are only using pings. You can press the ping button on the teammate and it will relay an affirmative or yes to them. For more advanced pinging, you can do some of the following. To alert your teammates about an enemy's location, you can double press your ping button to place a red marker. You can only have one of these active at a time. If you hold down your ping button, you will access the ping menu. There are currently eight different options to choose from in this menu. Here's a list of the current options going from the very top clockwise. If you want to get really fancy with those advanced pings you can setup hotkeys for specific pings. If you have a mouse with multiple buttons, or just want to designate a key for it you are able to do it in the controls menus. You can ping every equipped or usable item in the game. This is highly useful if you want to direct a teammate to powerful armor, weapons, or ammunition they might need. If you open your menu you can request weapons, ammo, missing attachments, and gear from your teammates. You can use this ability to alert them if you are looking for specific ammo, or you are missing a piece of equipment. You can ping for specific ammunition by targeting one of the weapons in your equipment menu. To request gear, hover over the item you need and hit the ping button. If you want to alert them of a missing attachment, you can hover over it and hit the ping button as well. Believe it or not, you can call dibs on a certain item as a way to request the use of it over to another teammate. If a player pings an item like ammunition, guns, or gear a teammate can ping on it and it will call dibs. While this doesn't really actually do anything (it doesn't reserve the item for you), it does allow you to relay the message that you need a certain item and are basically asking politely for it. This can go a long way towards working together and making sure each player has what they need.